High five delivered, mom is appreciative. She meant Walgreens. And count your blessings, who would want the guilt of initiating ENS. Hilarious well-written post! Best of luck in your studies at BYU and in all of life. 😀 Nice selfie, Cat Man. It took me forever to figure out what was being reference in footnote 3. Doh! I’m grinning here. What a sense of humor your mom has. Many thanks for taking a look at my blog and following it. I appreciate it. Too funny, your parents are very clever – You must have endless stories about the things they did while you were growing up. Wow, I’m going off to college soon and my parents are starting to make me pay for my own shampoo and stuff now! Parents, bleh! I love it! I feel like writing signs like that for my own home, but as I cannot evict my roommate, I guess I better not. as one who is sending kids off to college left and right – your mom has got it going on. also, i’m concerned that she had to tell you where the towel rack was in the bathroom. I have to admit that I’m in your parents’ camp — having a 20-year-old who has most of his body out of my apartment, yet is hanging onto the door stoop with one Sperry hooked like an eagle’s talon. Bathrooms must be a universal war zone. All adults want is for the neophyte humans to pick up a few things, put a few things away, and swish the bowl with Clorox toilet bowl cleansers once-in-a-while. Believe me when I say the ENS is something ALL parents hope to achieve. We had you, we raised you, now vamoose! Sorry for the rage. Just think a different perspective is always beneficial — as is catharsis. Thanks for visiting my online writing website, and for opting to follow my work. 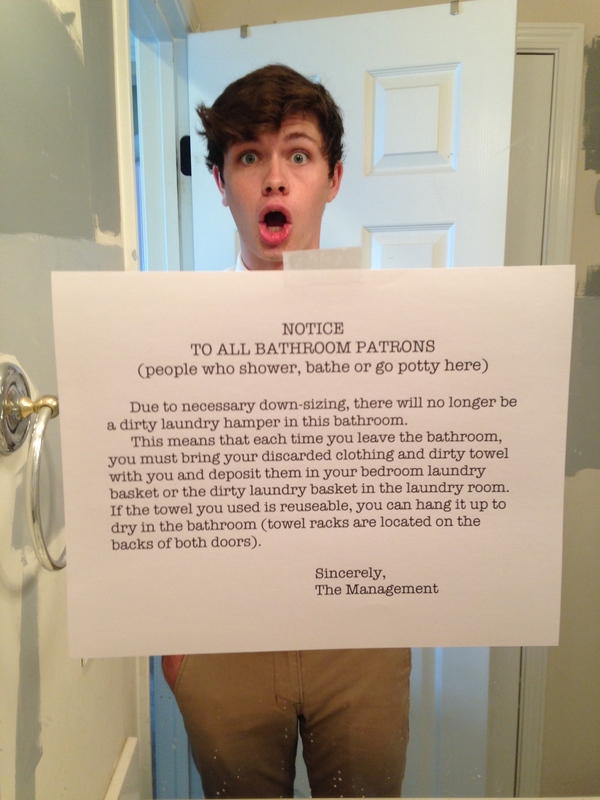 As the oldest of four kids who use that bathroom I can say amen to that. And I totally see what you mean about ENS; childhood was great, It’s sad to leave mom and dad, but it’s definitely time. Thanks for reading! At least your mom gave reasoning for the disappearance of the hamper, and at least she didn’t use comic sans. I do have that to be thankful for. Comic Sans: Scourge of humanity. O to the M to the G. I am knocked out by your writing! So glad to have made the connection. Hahaha love it, tell me does your Mum have a blog, I think I’d like to read it if she has. by the way, thank you for your visit and like on my page, very much appreciated. Ha ha – good on your mum! Your third and fourth lesson bullet points made me laugh out loud. Thank you.